Welcome to the launch of our spiritual journey vlog & spiritual awakening stories podcast. At Soul Sisters Cafe Podcast, we are on a spiritual journey. We are two lifelong friends who have journeyed alongside each other through thick and thin; through life, loss, growth, and self-transformation. That’s why we created the Soul Sisters Cafe, a podcast and vlog about our spiritual journey & spiritual awakening stories. In ... See More this first episode, we share some of our spiritual awakening stories and explain why we started this next chapter in our spiritual journey. We also talk about how our friendship has made our spiritual journey that much more rich -- and how we help each other through the dark times when we can’t see our own light. When we decided to make a podcast, our goal was to create a fun and inviting space where we could air our “spiritual laundry” and share the trials we come across on our journeys while helping others see that they are not going through it alone. 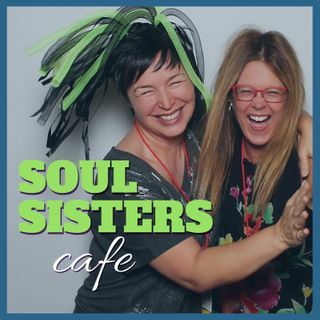 For our first episode, we want to introduce ourselves and give you a little backstory on who we are, why we created Soul Sisters Cafe, and why you might be interested in our show. We want to live our spiritual journeys authentically and out loud to show that not life is not about competing with everyone around you -- it’s about loving yourself under all conditions. Shifting our perspective on self-love doesn’t happen overnight, but now is a good time to start. When we (Tracey and Jordan) met, we could not have been more different. Despite our opposing outlooks, we formed an unbreakable bond and have been friends for over 30 years. During that time, we’ve weathered all sorts of storms together -- whether that be relationship issues, moments of darkness, or friendship struggles. We’ve bonded through our spiritual journeys and have even shared strikingly similar life experiences along the way. The key to our soul sister bond? Being a mirror for each other to reflect our inner light... and giving each other the freedom to be who we truly are. Through this bond, we have watched each other grow and evolve into the spiritual seekers we are today. We know that, when you’re going through dark periods in your journey, it’s so easy to lose sight of your own divinity. The good news is: Someone else can see that good in you, even when you can’t. It’s important to look to these people during those difficult times to remind yourself that you are a gift of the Creator, just as they are. This is what we do for each other -- and we want you to join in. That’s why we’re bringing you into our inner circle so you can feel how yummy it really is. In fact, that’s what the Soul Sisters Cafe is all about: reflecting your divinity back to you. Our purpose for sharing our journeys on Soul Sister Cafe...and with you! We hope you enjoy this episode, and we can’t wait for all the open-hearted discussions to come!